Meet little LindyBUG, happy pumpkin girl in her new flax dress. 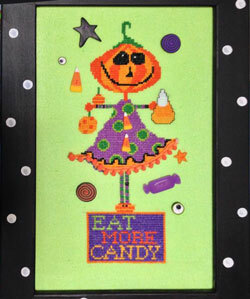 Eat more candy… I’ts the most wonderful time of the year! I used DMC floss; she would be adorable stitched with overdyes also. If you wish – just replace DMC colors with the same base colors in your favorite brand of overdyed floss. Just Another Button Company makes the buttons – the pom-pom trim is also an extra touch of Cute! Dames of the Needle made this cute mini pom-pom in the color Fra-Orange. Black and White Polka DOTS frame available from ABDesigns. Ask your favorite shop to order all of these embellishments for you.